These little paper-wrapped sponge cakes are one of those things I've wanted to try to make for a long time. I think we always want to re-create things we buy and love to eat, at home with our own hands. Since I love to eat so many things, I have a long list! For practical purposes, I wanted to make these cakes with things I already had at home. So I used my regular muffin tin and made my own parchment paper liners for them. I cut 6-inch squares of parchment paper and molded them over a small can (one that would fit/sit in the opening of one of the muffin cups) to crease into shape. This is as crafty as I get, which is to say I am not crafty at all. I have to tell you that for some reason, I was compelled to tap my batter on the countertop (I was concerned about the batter not reaching all the corners of the paper liners) and that probably was not a smart move when the cake batter is a fluffy one where you want to preserve the airiness. Hopefully, my banging didn't do too much harm but I'll be sure to skip that step next time. The cakelettes are so light and rather adorable. It's fun to unwrap them from their papers...and just dig right in. It doesn't take more than a few bites to devour one of these. With matcha desserts everywhere lately, I was tempted to flavor these with some matcha powder. In the end, I stuck with the classic and what I know I'dm sure to love, which are this purely eggy little bites. But for anyone more adventurous than myself, a green tea version might be worth a try. Line a standard-size muffin tin with six parchment paper liners. I made my own according to these instructions. Preheat oven to 392 degrees (200C). Sift the cake flour, cornstarch, and salt together twice and set aside. In the bowl of a stand mixer fitted with the whisk attachment (or using a handheld mixer), whip the egg whites until foamy. Continue whipping while gradually adding the sugar to the mixture until stiff peaks just form. Lightly beat the egg yolks together with a fork. Add vanilla extract and scrape the yolk mixture into the beaten egg whites and gently fold together. Add the sifted flour and fold in until combined, and there are not streaks of flour in the batter. Mix a few tablespoons of the batter with the melted butter, then add this mixture back into the batter and fold again to combine. Use an ice cream scoop to divide the batter among the six paper liners. Place the muffin tin into the oven, then immediately turn the oven temperature down to 350 degrees. Bake for about 20 minutes, or until cakes are golden brown. Oh my gosh, we love these little sponge cakes from the bakery! They are my husband's favorite!! Yours look so fluffy and light and I love that you wrapped them up just like the bakery version! They look perfect! These little sponge cakes are so light and beautiful. Thanks - us fans of chiffon cakes would adore these little things. MY GOODNESS! Monica, you take me right back home! My mom used to buy these for my sis and I as breakfast all the time! I miss these little 紙包蛋糕! As you said, they are so soft and fluffy. Great useful tips for the parchment liners. Have to make this soon! Bookmarking and pinning! I wish I could read Chinese! haha. I hear you. I used to make a quick lunch of them on the go and every time, I marvel at how perfectly light and soft they are! You know I have been trying to figure out how to make the typical Chinese sponge cakes (the ones for layered chestnut cakes) and that recipe eludes me. I hear that it's actually made from a box/mix! Can it be??! Oooooo.... You can't read Chinese? I was wrote "paper wrapped sponge cake" in Chinese. When you mean "typical Chinese sponge cakes", are you referring to those in HK Maxim's Cakes? If so, I think those are chiffon cakes. Thank you! Funny enough, I've seen this in my search for the cake recipe. I think it is very similar to the bakery cakes, just composed differently. It's funny because the times in the past (when I first started the blog) when I tried to follow trends or post things when I was "supposed" to, I was mostly disappointed and unhappy with it...so I stopped and I mostly just make things my family and I will most likely enjoy, while making some room for trying new things and branching out a bit at the same time. These little eggy cakes are a classic for us and I could eat them all the time. Thanks, Sonali. That golden crust is incredible! The lovely soft crumb inside - gosh I would love to taste these. I love a simply wonderful cake - it sure looks light and not overly sweet. Beautiful Monica! It's fragrant, light, and mildly sweet. It's like a chiffon cake but even softer, Tricia. I LOOOVVEEE Chinese sweets, exactly because they're not crazy decadent but are still totally delicious! These little sponge cakes sound so good! Never heard of such magical things beffore but im loving these! We could have polished off another 6 of these cakelettes pretty easily, too. Thanks, Betty. Thanks, Asha. I'm glad I kept them in their plain eggy vanilla-y goodness, too. Hi! 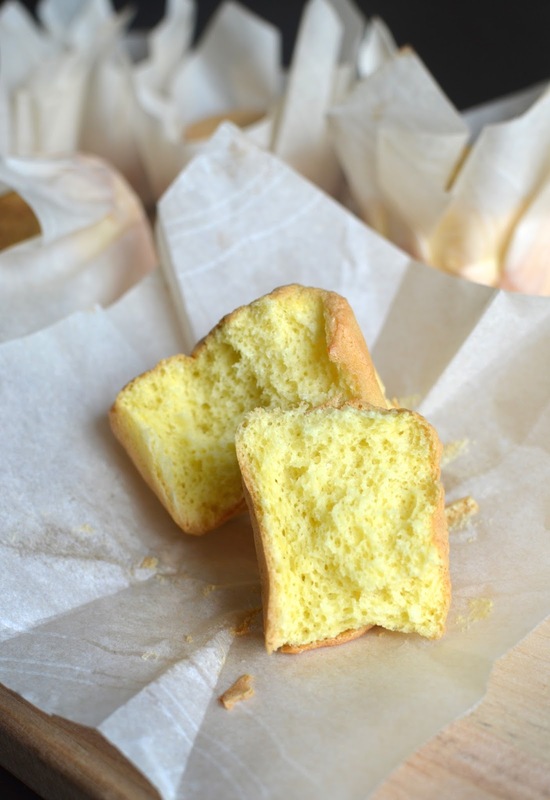 Thank you for posting, ive been searching for this recipe, but the bakery that I used to go to had coffee sponges like these. Any ideas on how to add that bit of coffee? I'm thinking add some instant espresso? Or a shot of cold espresso to the beaten yolks? Hi there...obviously, I've not tried it but I think both of your ideas make sense. I know that whenever I make coffee flavored bakes, I go with instant espresso powder...they dissolve quickly and you don't have to worry about watering down the batter too much vs. using brewed coffee or espresso. Good luck with your endeavor!